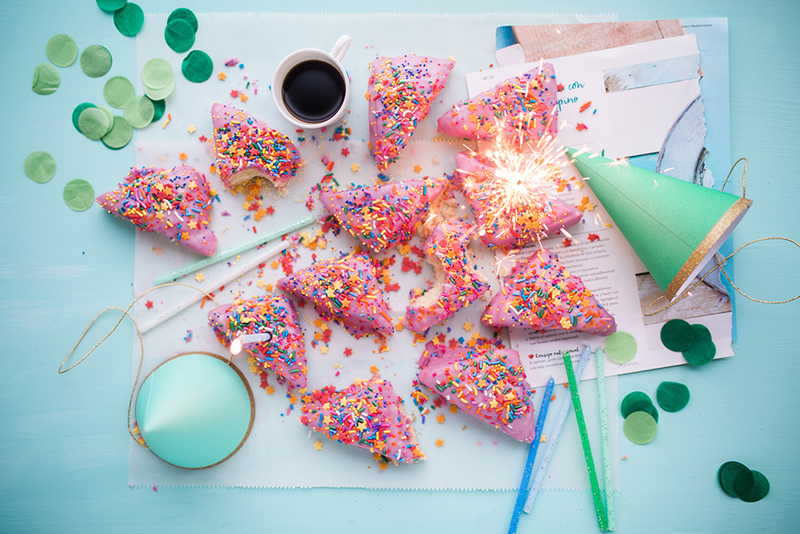 It’s my birthdate anniversary…yet another year bites the dust! I can only wish that my birthday will be as pink and minty as this gorgeous photograph. Tomorrow marks the very last day of my 28th year, which has definitely been a year of ups and downs. Some very major downs, but also some pretty good times. So I thought it might be a nice opportunity to think about the past year and what I’ve achieved. In my head, I am still 25 years old; I still carry a Young Person’s Railcard, I still get annoyed at being asked to show ID at the supermarket when trying to buy a bottle of Malbec (“It’s Malbec for goodness sake! It’s £15! Do you think I’d be buying something so ridiculously expensive if I was still relying on a student loan?! Do you seriously think 20 year olds can afford to buy wine from Waitrose? Do you see any baked beans in amongst the quinoa and chia seeds and gluten-free sourdough? Do you? ?”), and I still have my whole life ahead of me to figure everything out. In reality, I’m not 25. I don’t get cheaper rail fares, and I get hit full whack every time I travel (note: this does not hurt any less as years go by. I can’t wait to be old; I am going to travel by public transport ALL THE TIME.). Nowadays, people so rarely ID me, that I am beginning to worry about the lines forming around my eyes and on my forehead. When I do actually get asked for ID, it’s actually a little embarrassing because I can never remember if I remembered to bring any along with me. The last time, I was in Morrison’s buying a small bottle of bourbon because, being very middle class, it was needed in a recipe for Cranachan our host was making for a Burn’s Night dinner party. “ID?” asked the woman. I fumbled for it, and asked brightly: “That’s very kind of you to ask. How young do I look?” She looked at me as if I was completely mad, and said “I don’t know, like, 19?”. And here’s the thing – inside, I did a happy dance. And yes, I know 19 is still over 18, but she thought I might have been an edge case. And I felt COMPLIMENTED, genuinely. She even managed to look a little bit embarrassed when she checked my age, but I didn’t care. It’s actually nice for people to think you look young, and it’s when you’re not a spring chicken anymore you finally appreciate that. As for having my whole life ahead of me, I read a slightly depressing Wait But Why article that made me wonder whether I should begin to life a bit more of a death anxiety lifestyle. How petrifying is this?! 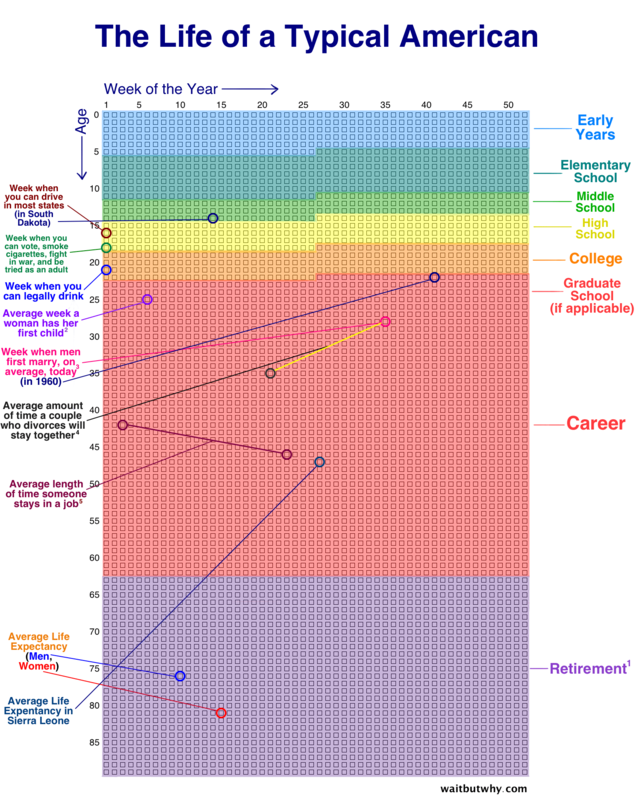 This is your life in weeks. Every square is one week of your life. Everything you put off for one week is just eating up another one of those little life blocks. I’m probably a fifth into the red ‘career’ section, and actually, I am doing okay. Mostly because: I like my job. I genuinely do. But I feel a calling for something more creative, and I don’t believe in birthdays being anything more than a chance to look back at the previous year, and plan ahead a bit. Maybe this is a wake-up call for me to do something before I get to the purple section of ‘retirement’ and realise that I wasted time. I removed myself from some toxic relationships. Friends, partners; people that made me feel bad about myself and encouraged negative thought patterns. I’ve removed more friends from Facebook this year than I ever have, and feel so much better for it. I ended a relationship that was bad for the both of us, and am going through the necessary but difficult process of formally ending it; I’ve completed the first step to making a fresh start on my life. I’ve found my style, and it continues to develop. I’ve been experimenting for the past couple of years with retro styling, and have amassed a gorgeous wardrobe of fancy pants 50s style vintage reproduction clothing. This has been huge for me. Not only does finding clothes that fit me give me more confidence, but complete strangers now compliment me on my style, ask me where I buy things from, and tell me that my style “suits me”. I’ve never had this before. I’ve always hidden from the world in poorly-fitting, grungy, eclectic clothing that made me feel awkward. I made space. I adored having a lodger, but after a few years it was time for a clean break. I’ve been on my own, and I’ve discovered how to fill time and space with things that I love. I’m making my spare room into the office of my dreams, and it now has two desks in it; one for writing, and another longer one for crafting and making artwork. I’m learning how to be on my own, and curate my home with the things I like. I’ve made the space to reconnect with myself, and I feel so much better for it. I’ve made my job my own. I run a small software development team, and I love it. This year, I’ve focussed on hiring the right people, and encouraging an atmosphere of healthy work-life balance, and creating gorgeous interfaces that are used by the whole organisation on a daily basis. I’m constantly learning how to be the best manager I can, and I’m trying to improve myself. This past year, I’ve learned how to pick my battles better. I’ve learned how to reframe, rephrase and rethink. I inject as much creativity into my work as possible, and I’m doing my job, on my terms – and in making it mine, I’m tackling the grey cloud of imposter syndrome that sits right above me, and slowly, it’s evaporating away. I’ve made new friends. I absolutely adore the supportive community of pinups and artists on Instagram, and the Etsy resolution alumni on Facebook. People are wonderful, and sometimes you come across creative and wonderful communities of people that are just like you! I’m ever thankful to all these people I’ve befriended over the past year. I am less scared. I am an incredibly private person, but I’m trying to unlearn that. I’ve been sharing more and more about my life, and I am less scared about being open. I share my mental health stories and my daily outfits on Instagram, and I do not feel ashamed or nervous, and I’m not chasing likes. I do it to share. I’m also less scared about what happens when I say ‘no’. I used to think that saying no to things was always the wrong decision as I felt you might miss out on something. Thing is, if you’re choosy about what you say yes to, it means so much more to those things you DO end up doing. I finally got POTS diagnosed. I’ve been fainting a lot ever since I was a kid, and FINALLY I got my diagnosis – postural orthostatic tachycardia syndrome. Basically, when I stand up for longer than about five minutes, my heart stops, my blood pressure drops, and I pass out. Cool, huh? The nice thing about a diagnosis is that I can understand why it happens, and take steps to prevent it. And because it’s a diagnosed condition, I have a medical reason to avoid rush hour; if I can’t sit down for a journey longer than ten minutes, then I can’t travel. I lost a furry friend. The lovely, hilarious cairn terrier I grew up with finally passed away. He was such a character; incredibly boisterous, very grumpy, and very patient. Gynaecological health problems. I’ve been having health issues of my own, mostly because my body has been weirdly out of sync. At the moment, I’m having full-on periods every two weeks, with acute period pains and bleeding pretty much every.single.day. It has felt like hell. They think it may be endometriosis, which sounds right, but they’re taking their sweet time actually diagnosing me properly. The lows have been really low. I’ve had a few dips this year, sometimes so severe that I can’t physically talk or move. I suffer from a potent cocktail of depression, anxiety and body dysmorphia, and when it gets bad, it gets BAD. So I guess now that I’ve reflected a bit, I guess I should consider my goals for the next year. I don’t believe in ‘thirty before thirty’ lists, because life is pressure enough as it is; why add more reasons to make yourself feel like a failure?! However, I do believe in measurable and considered aims. Having a set of goals means I can look back and see what I need to be working harder to do and may even give me an insight into the things that I THINK I want to do, but don’t actually end up doing. Be a better friend. Remember birthdays, remember when the big things happen. And keep better in touch with the people I care about. Read more. I have so many books I want to finish, but I never seem to make the time. It can’t be that difficult to squeeze an extra 20 minutes a day in, can it? Finally set up my Etsy shop. I’ve been considering this for years. I should take the plunge this year and actually sell some of the artwork I spend hours making. Write more. Whether that’s blogging, entering competitions, whatever it is – write more if it. I had two pieces published in February and it would be amazing to get another published before the end of this year. Make the most of mornings. I sometimes get up at 11am and go to bed at past midnight. I actually function better on more sleep, so I think it’s time to address the inner student in me; if I get up early, I can meditate, do yoga and stretches, and eat some breakfast at a leisurely pace. If I don’t, I miss breakfast entirely, and rely on caffeine to propel me through to lunchtime. It’s immature, and I just need to kick myself up the bum and sort out my life like an adult. Drink less caffeine. I drink way too much, and I know it is bad for anxiety sufferers. I’ve been cutting down recently, and now I have mostly decaffeinated. I don’t feel too much different, which suggests that I don’t really need the extra caffeine boost. In case scientific research is correct and caffeine can lengthen your life, I guess one cup a week is a nice compromise, no? Take better care of myself. I recently saw a physiotherapist, which made me realise how much I’ve been avoiding taking care of number one. If I want to make it to old age, I need to be healthier. I should be walking 10k+ steps a day, jogging at least twice a week, and doing something like yoga classes to stretch and keep myself in shape. I know that’s unrealistic if it isn’t a habit though. So, my goal? An average of 10k steps a day, and jogging once a week. And that’s it! Seem like too little? Too much? What would your seven goals be? I’d love to know! Anyway, I have far too much cake to be eating, too much gin to be ID’d buying, and the most enormous pile of presents to open (she hopes!). Here’s to a year of fun, success, and chocolate! Happy birthday!! I hope by now you’re enjoying your surprise holiday, and have new cake to eat. I made a before-30 to do list when I graduated college and it was, quite frankly, hilarious to reread, so I like your approach of making broader goals. I certainly hope you’ll keep writing! And congratulations on making those tough changes last year — here’s hoping they continue to be rewarding and improve your life!